WASATCH DRIVE AND MARIO CAPECCHI INTERSECTION: Installation of a gas line crossing Wasatch Dr. and Mario Capecchi will take place on Sept. 11 and 12, during which time the intersection will be completely closed. On Friday, Sept. 14, the intersection will reopen to the one lane through traffic pattern. POTTER STREET: The State Historical Preservation Office work on Potter Street began last week. Potter Street is blocked off on the east side near Ft. Douglas Blvd with parking blocked off north of the Ft. Douglas Museum. Parking is still available on the southwest end of Stillwell Field near the special events entrance to the field. SOCCER STADIUM CONSTRUCTION: Construction on the soccer stadium began on Sept. 5. Rows 11-14 (the L shaped area off the road) and row 88 (the old tennis courts) are fenced off. The roadway and additional parts of the area will not be closed until after construction on Wasatch Drive is complete. These are permanent closures and parking will not return. See the map of closures below. SOUTH CAMPUS HOUSING UTILITY RELOCATION PROJECT: The utility relocation project in the parking lot of Honors Housing continues. Expect closures through September. The area in front of the Annex will be completely fenced off through mid-September. HEB ROOF CONSTRUCTION: Roof replacement on the chemistry building is taking place now through Oct. 20. Pedestrian traffic can continue as sidewalks will be covered for protection. ADA ROUTE AND STALL INTERRUPTIONS NEAR UMFA: Now through Oct. 15, 2018, the ADA route, stalls and sidewalk near UMFA will be interrupted for construction. 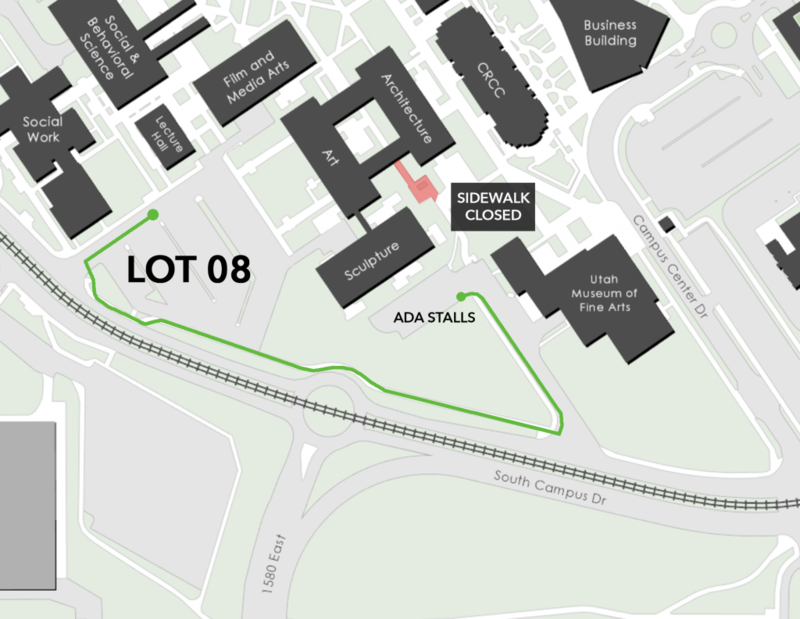 Pleases use the alternate route (indicated in green below) through lot 08.For ADA Access questions, contact OEO/AA at 801-581-8365 or OEO@Utah.edu.For Lift/Paratransit Shuttle, contact Commuter Services at 801-581-4189. Installation of a gas line crossing Wasatch Dr. and Mario Capecchi will take place on Sept. 11 and 12, during which time the intersection will be completely closed. On Friday, Sept. 14, the intersection will reopen to the one lane through traffic pattern. Traffic patterns to continue as is until Sept. 15. Anticipate Wasatch Dr/Student Life to be fully paved by that date. Wasatch Parking Lot is under construction with a tentative end date of mid-November. Roundabout work by USTAR to begin after the intersection is open. Wasatch Dr. will be down to one lane allowing traffic to flow northbound from Mario Capecchi to Dumke Softball Stadium. After Dumke, north and southbound traffic will be open. No access to Student Life Way will be available. 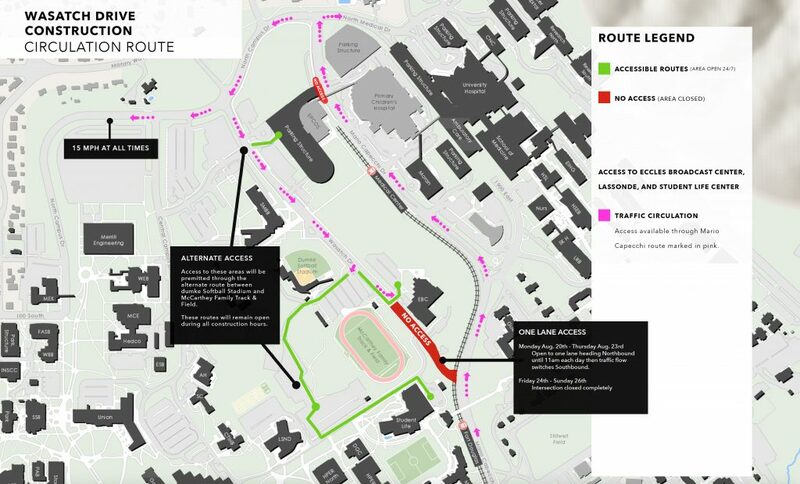 Access the Student Life Center and Lassonde using the route between McCarthey Family Track & Field and Dumke Softball Stadium. Please note: left-hand turns will NOT be permitted into Student Life Center from Mario Capecchi. Please use the alternate route. Road upgrades will occur through summer 2018 and are expected to reopen in August 2018, when the project will move into another phase. The 45-degree angle parking stalls on Wasatch Drive may be affected in order to allow for additional lanes of traffic to flow. People are being redirected to park in the lot directly west (lot 24). WASATCH EXPRESS DETOUR: The Wasatch Express will detour straight to the Ambulatory parking garage using North Campus Drive. If you have any questions about the Wasatch Express or if you would like additional information on campus transportation, contact U Commuter Services at 801-581-4189. 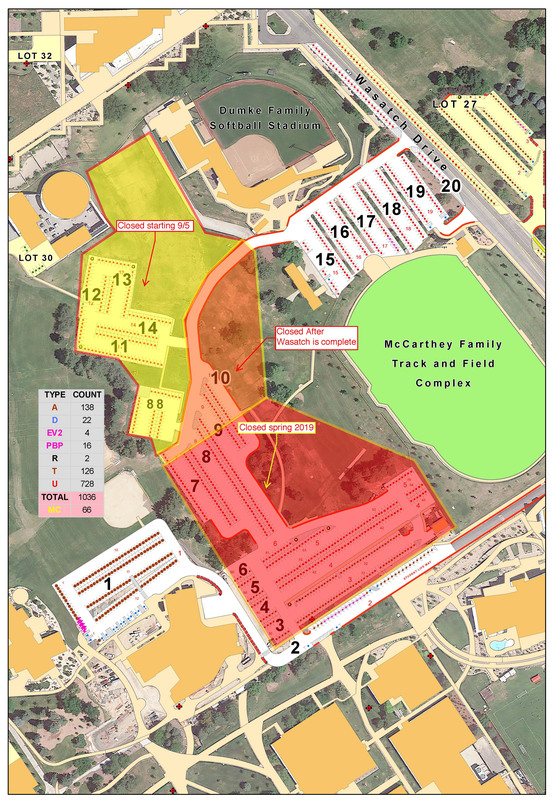 UPDATED MAP: See the updated map below showing the traffic plan and circulation patterns with access to McCarthey Field Parking and Student Life Way. WASATCH EAST PARKING LOT: The north portion of the Eccles Broadcast Center parking lot expansion has been established. The disk Golf field will be turned into a new parking lot which will provide over 400 new stalls. The construction is to go through the remained of summer and into the fall 2018 semester. HTW COMPLETION: High Temp Water Pipeline replacement completion will be occurring campus wide with sections being fenced off throughout mid-October 2018. STORMWATER DRAIN PLAYFIELD CONSTRUCTION: The grass field between the McCarthey Family Track & Field and Lassonde Studios is undergoing construction to install a storm water drain. This project is expected to last two years and be complete August 2019. Access to this area will be closed for the duration of the project. HIGH TEMPERATURE WATER LINE REPLACEMENT (STUDENT SERVICES) : The north section of the Student Services front plaza will be closed to the public through December 2018, for construction of the High Temperature Water line. WEST MEDICAL GARAGE CONSTRUCTION: The West Medical Garage (between the Moran Eye Center and the Ambulatory Care Complex construction) will only have access via the two widened ramps on the south side of the garage. The east side ramp will remain closed until ACC construction is completed in 2019. See the construction impact map below.